Hey, that tastes good! 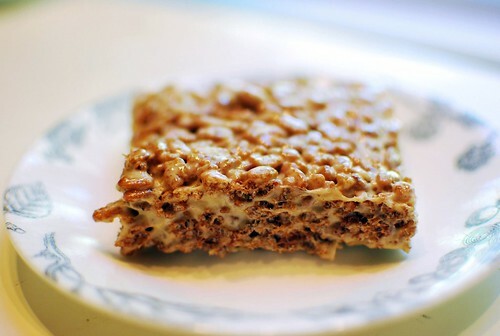 : Rice crispy treats NEW AND IMPROVED!! Rice crispy treats NEW AND IMPROVED!! We all know rice crispy treats. Apparently I already talked about them this year, but I'm going to talk about them again, real quick. I've been eating rice crispy treats my whole life. Butter, marshmallows, crispys. This time something magical happened. I stirred in some peanut butter. WHAT!! It was awesome. I feel like I've been missing out my whole life. Did you guys know about this? Melt butter and marshmallows in whichever method you want. I like to use the microwave, but if you use the stove don't forget to stir constantly. This is hard work. Once your marshmallows and butter are melted, stir in the peanut butter, then the crispys. Press into a buttered pan and let cool, then try not to eat all at once. I had cripies like this in Bellingham, WA a few months ago, except they had a nice thick layer of dark chocolate on top. And were roughly the size of your average cinder block. Superb. Needless to say, I'll be trying this recipe as soon as humanly possible. Thank you! I've had some like that before, but not GF! OF course, peanut butter makes everything better. This sounds really tasty. I have a peanut and corn allergy as well, but found this delicious recipe from Clean Food. Combine with 4 cups rice crispys. Press into an 8x8 pan. Oh my goodness, that looks so yummy! I bet my kids will love them!